Aggressively growing and eventually blooming in late May or early June, multiflora rose is a weed that plagues many pastures. But through a variety of possible tactics, this meddlesome weed can be controlled. Dwight Lingenfelter, a weed science extension specialist at Penn State University, recently provided some control options in Penn State Extension’s Field Crop News. Two mechanical control methods often imposed are mowing and excavating. Multiple mowings per season are required over several years to weaken and kill plants. Excavating involves heavy equipment used to pull individual plants from the soil. Both options are time consuming and can be costly. 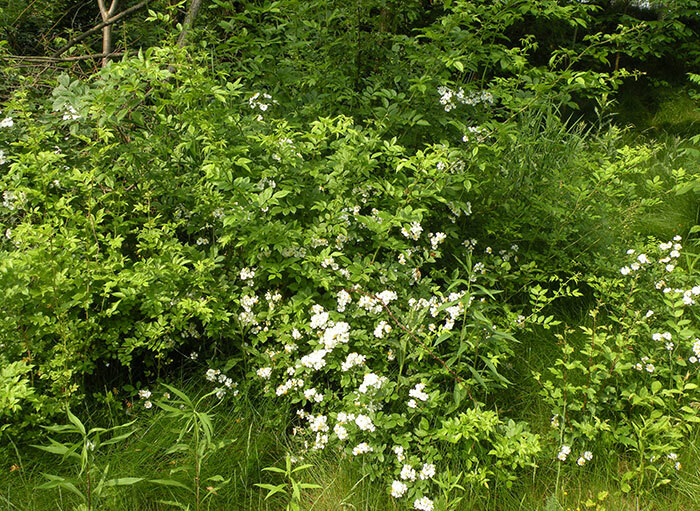 Biological controls are also successfully being used to kill or temper the impact of multiflora rose. The utilization of rose rosette disease (RRD) or grazing animals fall into this category. RRD is a virus that is slowly spreading across the northeastern United States. It kills infected plants within two years. Using sheep and goats can also be an effective tool, if properly managed. “Research has shown that eight to 10 goats and/or sheep pastured with compatible livestock such as cattle can help reduce multiflora rose and other brushy infestations,” says Lingenfelter. There are also several herbicides that are effective on multiflora rose, especially when they are applied during the bud to bloom growth stages. The three foliar applied herbicides that Lingenfelter suggests are metsulfuron, Crossbow, and glyphosate. “Glyphosate has been more effective in Penn State research when applied in the fall,” says Lingenfelter. “Products like Milestone and ForeFront generally are not as effective on multiflora rose while 2,4-D and dicamba are not effective,” he adds. Metsulfuron, which is sold as a generic or as Cimarron Plus, can be used as a broadcast or spot treatment. For best results with broadcast treatments, apply the product at a rate of 1 ounce per acre along with a surfactant. For spot treatments, use 1 ounce of product for every 100 gallons of water plus surfactant. Make applications in the spring after plants are fully leafed out but less than 3 feet tall. There is no grazing interval following an application. Crossbow can also be used as a broadcast or spot treatment. For broadcast application, use 1.5 to 4 gallons of Crossbow with enough water to deliver 10 to 30 gallons of spray per acre. For spot treatments, use 4 to 6 fluid ounces of product for every 3 gallons of water and spray until foliage is wet. A waiting period of 14 days is required for lactating dairy cattle if 2 gallons per acre or less is used. Glyphosate can be used as a spot treatment on isolated patches of multiflora rose. Apply a 1 percent solution, which is about 1 quart of product with 25 gallons of water, with a hand-held sprayer. Thoroughly wet leaves and stems but avoid runoff. “No matter which control tactic is used, follow-up maintenance practices are a must for long-term control,” advises Lingenfelter. He also recommends removing dead brush, annual mowing, and maintaining adequate soil fertility as good practices to retain control of multiflora rose and encourage pasture growth.